La poule or the egg? Who knew Christopher Nolan had such a Gallic sense of humor. In Nolan's latest movie, "Inception," Marion Cotillard plays Leonardo DiCaprio's wife. DiCaprio is a thief of an extremely specialized sort: He steals ideas from people by entering their dreams. Pulling off such heists (the ultimate inside job?) requires his exiting the dream before its natural conclusion. To insure this, DiCaprio's accomplice (Joseph Gordon-Levitt) will supply a "kick," which has the effect of waking him so he can scram. As their standard kick they use a recording of Edith Piaf signing "Je ne regrette rien." 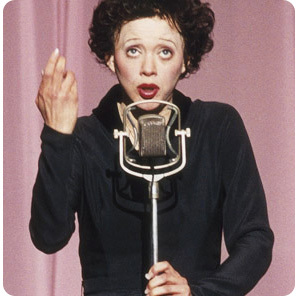 Cotillard, you will recall, won a best actress Oscar two years ago for playing Piaf, in "La vie en rose." So here's the question: Which came first, the singer or the song? This entry was posted on Thursday, July 15th, 2010 at 10:51 am	and is filed under Movie News. You can follow any responses to this entry through the RSS 2.0 feed. You can leave a response, or trackback from your own site.